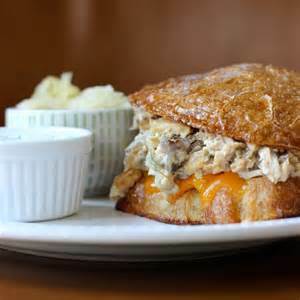 An American classic that makes a quick and delicious lunch, this tuna melt and sauerkraut delivers in flavor, texture, and good-for-you ingredients. Like crunchy, chewy sourdough bread stuffed with a generous mix of tuna, mayonnaise, caramelized onions, and garlic. Topped with soft, melted layer of mild cheddar cheese. Served up with a side of tangy, probiotic-rich sauerkraut. Fortunately, with a mercury limit that’s ten times stricter than the FDA standards, it’s easier than ever to get your hands on tuna that even pregnant mothers and kids can eat with gusto. Make a full meal of your tuna melt and enjoy it with a warm bowl of garden tomato soup. Slice the onion and mince the garlic. Slice the cheese. In a small pan over medium heat, melt 1 tablespoons of butter; sauté onion and garlic on low heat until soft and caramelized. Meanwhile, in a medium sized bowl, break tuna apart with a fork. Add mayo and mash together until desire consistency is reached. When onions and garlic are caramelized, mix them into the tuna mixture. Butter the bread, placing half butter side down in a large pan over medium heat. Lay a thin layer of cheese atop the bread, top each with 1/4 of the tuna/onion mixture. Layer remaining cheese and top with bread - butter side up. Cover and cook until bottom slice of bread is nicely browned. Flip and repeat on other side. Cheese should be completely melted by the time the sandwich is done grilling. Serve with a side of ranch dressing and generous scoop of sauerkraut.